Modified trailer wiring – 10 May 2017. I have been having some trouble with the electrical connection between The Fire Bike and my trailer. I’ve changed both the plug on the trailer and the socket on the bike but can’t get things to stay connected properly. The connection is too loose causing me to lose lights on the trailer. 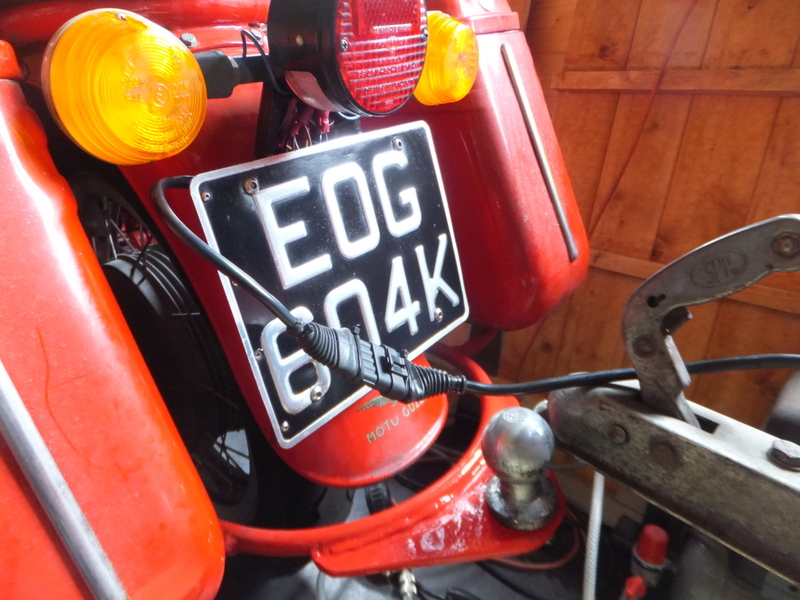 I decided that I would do away with the trailer socket on the bike and use the 5-way superseal connector I had fitted for the top box lights. Recently this has become pretty much redundant. I traced the wiring on the trailer to check out what does what before wiring in the other half of the superseal connector. Although all 7 wires of the trailer plug were wired up one wasn’t connected to anything and two others were joined together so only one of them was needed. Yellow “L” – LH indicator. Blue “54g” – Fog lamp (not used). Green “R” – RH indicator. Brown “58R” – RH tail but connected to both tail lamps. Red “54” – Brake lights. Black “58L” – LH tail but connected to both tail lamps. I therefore cut back and insulated the ends of the blue and black cables as they won’t be reused. It was then easy to fit the other half of the superseal connector to the trailer, or you would have thought so! I made a note of the numbered connections to the half already on the bike then wired the trailer the same, but that’s just too easy. The two halves are each numbered 1 to 5 alright, but in reverse order to each other! Once that was sorted all worked as it should. 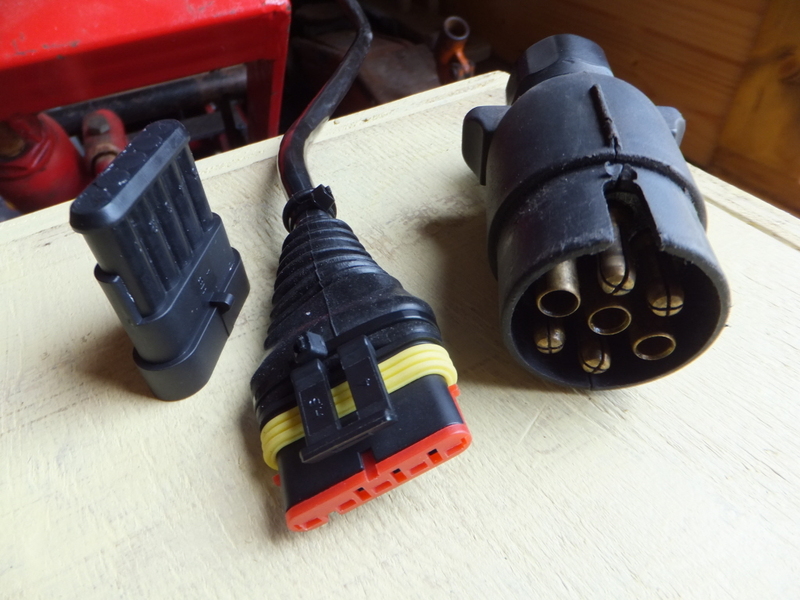 Here are the old and new plugs with a blanked off socket to keep the weather out when it’s disconnected. And connected up. When not in use the cable end is clipped up to the indicator bracket as it was before. In use it’s clipped to the tow bracket. I’ve used the trailer twice since making this modification with complete success. Experimental valve clearances – 7 May 2017. Well, I’ve finally sorted out all my old posts following the Photobucket debacle. I’ve done what I always should have and hosted my blog photos here in WordPress. As I indicated in my last post, I have got a bit behind with things which is why this is the first of a couple or so posts with a date well in the past! The valve gear on The Racing Rhino, my V7Sport, is really noisy. 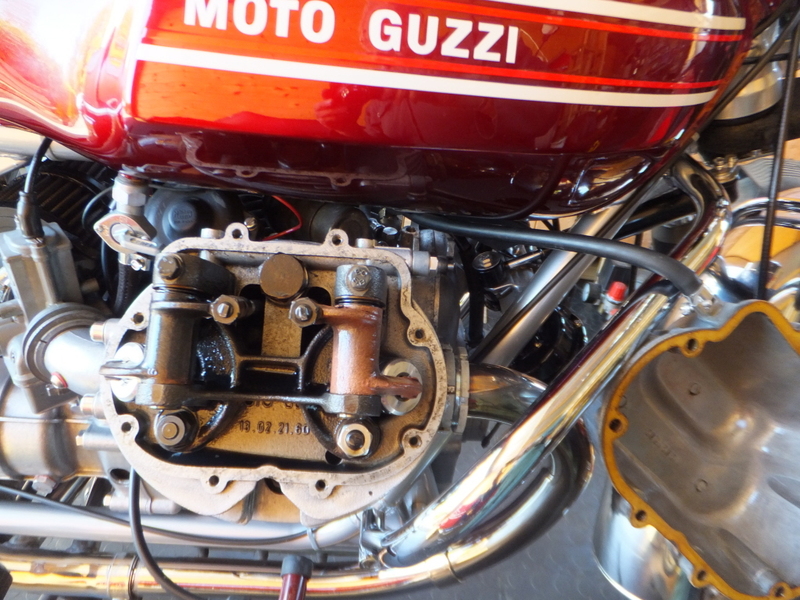 I know that Guzzi engines are always bad in this respect but I can’t see why there still needs to be so much noisy clearance even when the engine is really hot. However, it is important that there is always some clearance as there will be damage caused if a valve is held open due to a lack of clearance. I have friends who have run very small clearances but I am loath to do this and am naturally cautious. The first thing to do was to see what clearances I actually have. According to the book they should be 0.25mm both for inlet and exhaust. 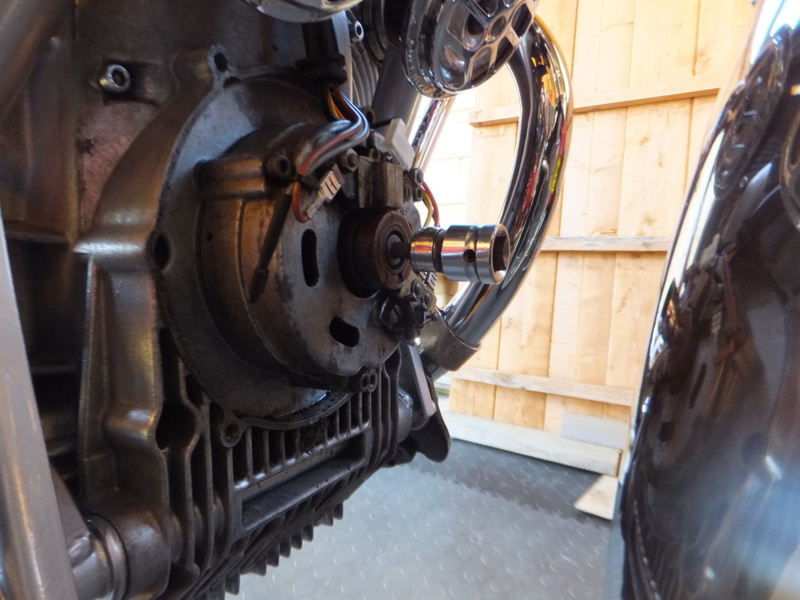 I removed the alternator cover so I could turn the engine using the rotor bolt. 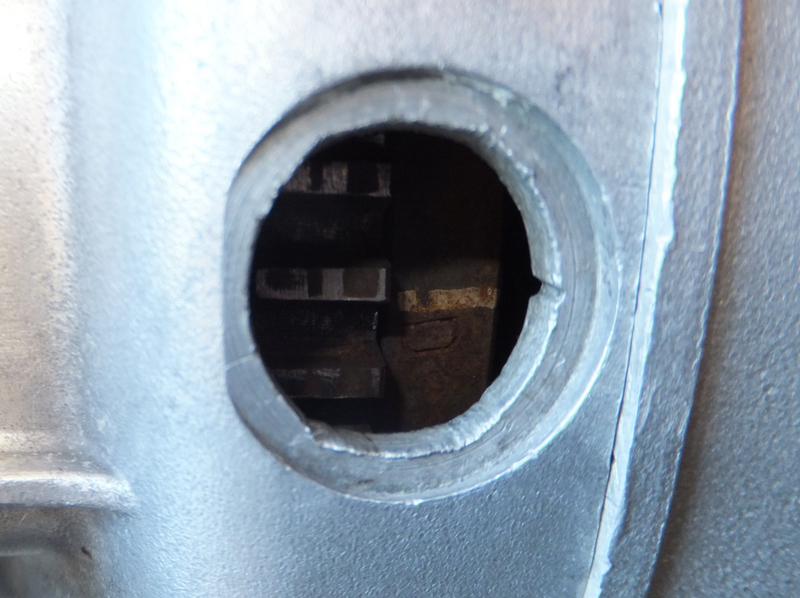 I started with the right hand cylinder so, having removed the spark plugs I turned the engine over until the D mark was in the window of the clutch housing. and removbed the rocker cover letting it hang on the breather hose. I measured the valve clearances using a “go/no go” method with my feeler gauges. Clearances were close to 0.25mm as they should be. After some research I decided to use “Roper spec” – clearances recommended by Pete Roper as safe. These are 5thou inlet and 7thou exhaust or 0.13 and 0.18mm. Right hand side adjusted, I did the same on the left ( with the S mark in the window). I went for a ride and the valve gear was marginally quieter. There was still a clatter with the engine really hot so I feel reassured that I won’t be burning any valves with these settings. I don’t think I’ll risk going any further though.